Yesterday I was strolling about the internet reading and stumbled upon an article on a local New Jersey news website about a $195,000 civil settlement related to repeated sexual assault on a female EMT by her male “chief.” This settlement and related events were discovered through an OPRA request (non-disclosure by both parties was a requirement of the settlement). The Township’s Joint Insurance Fund paid for the settlement. As though the events described in the court documents above were not terrible on their own- the chief is still employed by Mansfield EMS (Burlington County, NJ). Yes, he still has a job “leading” EMS providers even after violating one of his employees (on multiple occasions between 2015 and 2017) and creating a hostile work environment. As a non-profit entity I have to believe their board of directors is aware of these incidents- if not before, definitely after the lawsuit. Perhaps the above and the normalization of deviance therein shouldn’t surprise me since many New Jersey providers I know weren’t bothered by these events or that providers were left in this man’s care even after he demonstrated his inability to provide leadership or even simple care for another human being. In the same news cycle many came to the defense of two Mohawk Ambulance EMS providers harassed by a local council woman- but, few cared to defend this EMT. Yet, we wonder why this behavior persists in our culture and why we are not respected by other public service entities- we don’t take care of each other. What we allow is what will continue. What does this say to the citizens Mansfield EMS serves if a leader (and EMS provider) is accused of sexual assault and then the township settles (and attempts to hide these events)? Who are these citizens calling in their most vulnerable moments? Who exactly is showing up in their homes? Relatedly, how does this “chief” still have an EMT certification? While this is a civil settlement and no criminal charges were filed, per their website NJ OEMS has previously launched investigations (and some suspensions/ revocations) of providers certifications based on providers’ behavior or in some cases charges, not convictions. 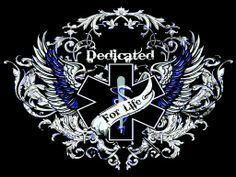 There are many excellent EMS providers in New Jersey; I have the privilege to work with a few of them. This one provider’s actions don’t reflect our mindset or beliefs- but our actions, or inactions, do. Allowing this kind of behavior in our community makes us liable. Not addressing this behavior allows the normalization of deviance of sexual assault and atmosphere of intimidation to continue. I hope the Township of Mansfield and Mansfield EMS and NJ OEMS will do what’s right and replace this chief to protect and honor their EMS providers and their citizens. I hope other New Jersey EMS providers will stand for their colleagues if this happens to them and if need be vote with their feet (you never know if it will happen to you). We are responsible for our profession and each other. What we allow is what will continue. “Chief” Lewis, we see you. The National EMS Memorial Foundation is a non-profit organization to honor the commitment, service, and sacrifice of our nation’s EMS providers that have died in the line of duty and those who continue to serve. The foundation also endeavors to establish a physical national memorial in our Nation’s capital or surrounding area, similar to those already established for police and fire. In addition to this mission, NEMSMF holds several events to honor our brothers and sisters who have made the ultimate sacrifice, and died in the line of duty. In conjunction with the National EMS Memorial Bike Ride held by the Muddy Angels, NEMSMF will participate in the send off ceremony for the East Coast route of the National EMS Memorial Bike Ride. The events will include the first Reading of the Names for 2017. There should be other events on the route- check the schedule if you are local to the route. The Weekend of Honor is comprised of multiple events to honor the EMS providers that have given the ultimate sacrifice and to provide support their loved ones, EMS providers, family and friends are welcome. Some of the events include: Welcoming the EMS Memorial Bike Riders to DC, Dealing with Our Loss for survivors, National EMS Memorial Service, and Family Breakfast. If you are unable to make it to the event, there is a link to a live streaming of the memorial service at the link above. An afternoon of fun with the NY Mets as they take on the Los Angeles Angels. Special pricing and packages for EMS providers available. Proceeds from this event benefit EMT Yadira Arroyo’s family and NEMSMF. Please share with your brothers and sisters. In the next few weeks I will be posting more information on NCEMSF and federal legislation related to the building of a physical EMS memorial in the Nation’s capital. Ah, EMS Week, full of granola bars, bat-belt chachkis, and music videos. No, not a typo, my EMS Week 2014 included the great opportunity to be involved in Lt. Farooq Muhammad’s latest and much awaited EMS rap video: A Day in the Life of EMS! Everyone involved in the making of this video embodied the true spirit of EMS. Even though some of us (patients) were not a part of their agency, we were welcomed and we all worked together to get the job done. Farooq’s videos resonate with EMS responders because under all the lights, sirens, and cool uniforms, the real qualities of EMS: teamwork, professionalism, and family, are illuminated. I was reminded of why this job is the best in the world while watching some of the other scenes being filmed. I became inspired to continue to learn and become a better provider in spite of the daily struggles with EMS nonsense that weigh most of us down. FDNY EMS Lt. Farooq Muhammad is one of the EMS 10 Innovator Awardees for 2013 for his work on videos promoting high quality EMS. You can see his other videos on his YouTube channel. Once again it is EMS Week – a week to recognize EMS providers, get free food, and maybe educate the public about EMS and what we do. 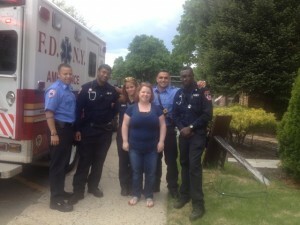 I recently had the opportunity to be part of a podcast about EMS Week hosted by Medic SBK. 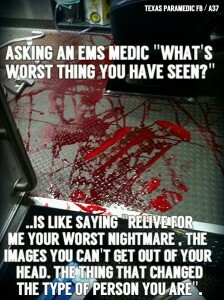 One of the questions he posed in the interview was, “What part of EMS Week is something we should be doing ALL year?” There were many great ideas that came up in our conversation that I was going to highlight here, but this morning when I was thinking about this blog post, I saw the photo below. We, as providers, don’t appreciate each other ALL year. 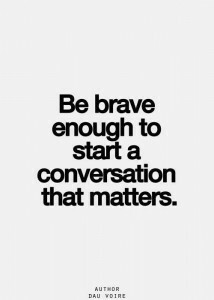 We pick at each other, catch attitude, stab each other in the back at the drop of a hat, but hardly anyone says, “Hey man, you’ve been doing great job. Thank you for giving your all.” How can we expect other healthcare professionals, our bosses, and the general public to appreciate what we do, when we don’t expect it of ourselves? Being dedicated for life is more than a tag line for a campaign. The things we see and experience take residence within us and resonate far beyond retirement. Most of us are so busy keeping on our game face on and pushing down anything that looks like emotion, that we can’t begin to recognize the lack of general wellness in EMS as a whole. Sometimes, I wonder if we forget that we are human. 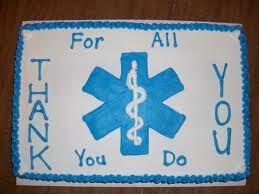 I challenge you all to say “Thank you” at least once a week to a fellow EMS provider. Really appreciate them and let them know you mean it. If you need to write a note because you get tongue-tied or shy then do it! Let them know you are thankful for ALL their sacrifice: the holidays, the birthday parties, the vacations, the lost sleep, the cold food, the fights with family, and even their mental sacrifice. I want to thank you all for your service and every sacrifice, no matter how small, to care for other people, most of which are strangers. You truly give your ALL, every part of you, and I am grateful that there are strong men and women out there to help us when we fall ill or are injured. Not everyone can do this job. You are a rare breed, and are to be treasured. I am honored to get to work with you and be a part of your life.